Reflexology has been around for centuries; however there are several theories of origination for this healing therapy. China is the most common, although Egypt reflects the oldest documentation from 2500 – 2330 B.C. Within all the cultures, they all agreed one important note: It is very important to take care of ones’ feet for physical, mental and spiritual balance. Reflexology is a gentle healing therapy that uses the physical act of applying pressure to specific locations on the feet, which directly corresponds to different part of the body/organs/glands. What are some health benefits of Foot Reflexology treatments? 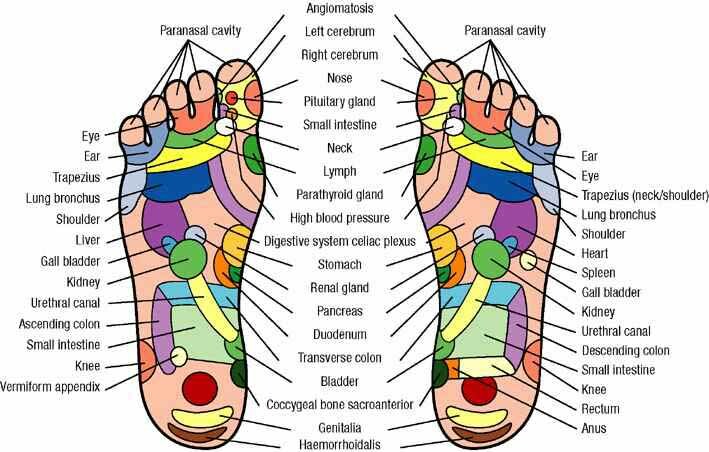 Reflexology helps balance ALL of your body systems, stimulating the under-active and calming the over-active. It promotes relaxation of body and mind, improves circulation, boosts an immune system by up to 25%, calms a nervous system, alleviates stress, and improves digestion. UNLIMITED BENEFITS!!! EVERYONE can benefit….For all ages from newborns to elderly. How will you feel after a session? Each person is different & reactions vary. Generally speaking, people comment on feeling very relaxed after a session; yet some mention they have tons of energy for the rest of the day.